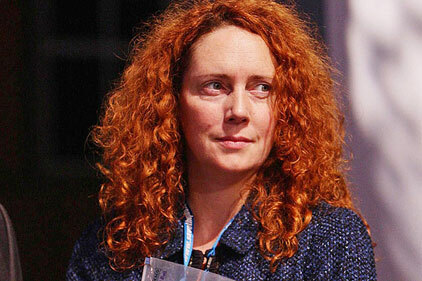 Rebekah Brooks, the chief executive of News International, has resigned from her position at the embattled publisher. Brooks has come under increased pressure over the past two weeks after revelations about the extent of phone hacking and payments to police at the News of the World continued to escalate. In an internal message to News International staff Brooks said: 'As chief executive of the company, I feel a deep sense of responsibility for the people we have hurt and I want to reiterate how sorry I am for what we now know to have taken place. 'I have believed that the right and responsible action has been to lead us through the heat of the crisis. However my desire to remain on the bridge has made me a focal point of the debate. 'This is now detracting attention from all our honest endeavours to fix the problems of the past. Calls for Brooks' resignation have come from many quarters, including victims of phone hacking and politicians of all parties, though she had received the full support of Rupert Murdoch throughout and her statement confirms that she had offered to go earlier but that offer had been rejected. Last Friday (8 July) Prime Minister David Cameron said he would have accepted Brooks’ resignation when questioned whether she should go and Deputy prime Minister Nick Clegg and Labour leader Ed Miliband have called for her to go. Yesterday, Rupert Murdoch, chief executive and chairman of News International’s parent group News Corporation, and James Murdoch, deputy chief operating officer of News Corp and chief executive and chairman of News Corporation (International), confirmed they would join Brooks in giving evidence to MPs. Brooks becomes the highest profile casualty of the fallout from the phone hacking scandal that has resulted in a number of departures from the company, not least the 200 editorial staff who lost their jobs when the company made the decision to close the News of the World after it became what News Int described as 'toxic'. At News International we pride ourselves on setting the news agenda for the right reasons. Today we are leading the news for the wrong ones. The reputation of the company we love so much, as well as the press freedoms we value so highly, are all at risk. As chief executive of the company, I feel a deep sense of responsibility for the people we have hurt and I want to reiterate how sorry I am for what we now know to have taken place. I have believed that the right and responsible action has been to lead us through the heat of the crisis. However my desire to remain on the bridge has made me a focal point of the debate. This is now detracting attention from all our honest endeavours to fix the problems of the past. Therefore I have given Rupert and James Murdoch my resignation. While it has been a subject of discussion, this time my resignation has been accepted. Rupert’s wisdom, kindness and incisive advice has guided me throughout my career and James is an inspirational leader who has shown me great loyalty and friendship. I would like to thank them both for their support. I have worked here for 22 years and I know it to be part of the finest media company in the world. News International is full of talented, professional and honourable people. I am proud to have been part of the team and lucky to know so many brilliant journalists and media executives. I leave with the happiest of memories and an abundance of friends. As you can imagine recent times have been tough. I now need to concentrate on correcting the distortions and rebutting the allegations about my record as a journalist, an editor and executive. My resignation makes it possible for me to have the freedom and the time to give my full co-operation to all the current and future inquiries, the police investigations and the CMS appearance. I am so grateful for all the messages of support. I have nothing but overwhelming respect for you and our millions of readers.